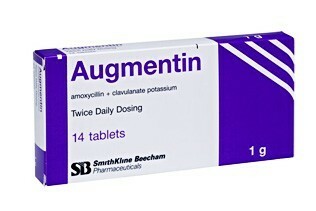 Augmentin is an antibiotic that kills various types of bacteria that cause infections. It contains two active ingredients, being amoxicillin and clavulanic acid. Amoxillin is a penicillin and clavulanic acid helps to broaden the spectrum of this penicillin. Used for treating: cystitis (bladder infections), skin infections, bone and joint infections. Tablets: swallow the tablets whole with a glass of water right before a meal. Course: usually takes 1 – 7 days.